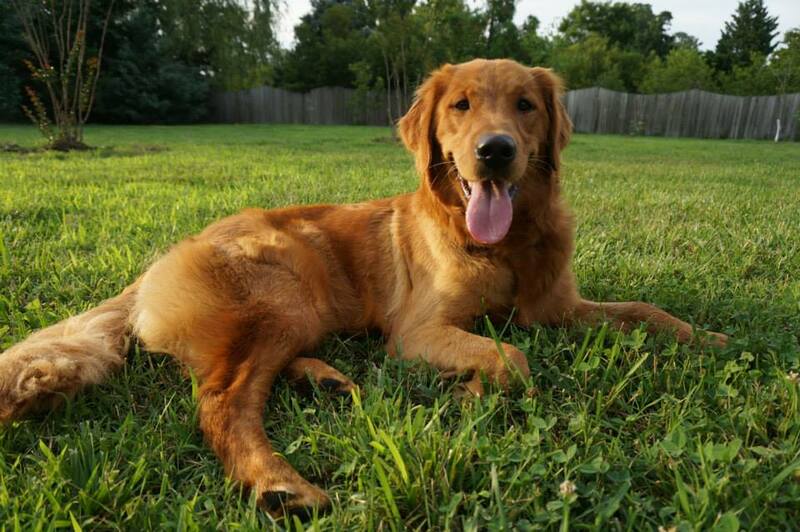 This week, we are featuring one of our non-profit vendors, Southeastern Virginia Golden Retriever Rescue Education and Training (SEVA GRREAT.) These dog-lovers have been rescuing dogs and educating the public about their care for almost 20 years. SEVA GRREAT connects goldens to their forever homes, and they are always looking for fosters, volunteers, and members! SEVA GRREAT has found a natural home at the market. The South of the James is a very dog-friendly market – from Mugsy’s Dogtown Lounge to Sara England Prints to Clementine’s Mobile Munchies, not to mention the occasional falling donut, there are plenty of things for dogs and dog-lovers to enjoy. Like, Share, or Comment on this post on the GrowRVA Facebook Page, and you will be entered to win an adorable framed Sara England print! We’ll pick a winner at random and announce it on Facebook Friday at 8:00 pm. Southeastern Virginia Golden Retriever Rescue Education and Training Inc. or SEVA GRREAT. 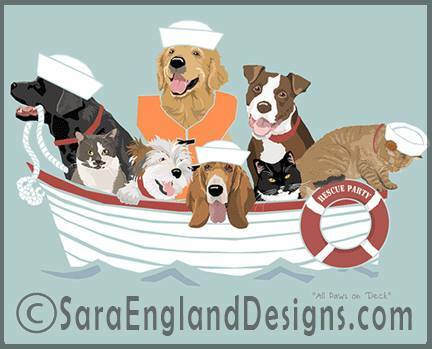 Sara England Golden Retriever Prints and Coasters as well as our annual Golden Retriever rescue calendars. SEVAGRREAT has been in business since January 25, 1994 as a 501 (3) c organization/non profit. The one thing that I think would surprise folks about what we do is accepting dogs that have extraordinary medical conditions that the owners of the Golden’s can not afford and we cover their medical expenses and find loving homes for them once they are fully recovered. We have found extraordinary families with such big hearts that they have taken in a dog with juvenile diabetes that became our SEVA GRREAT Ambassador for juvenile diabetes and another one that needed two hip replacements. The fact that we are comprised of all volunteers and continue to make such an important impact of saving the lives of countless dogs that have been mistreated, neglected or come from families that could no longer afford to care for these dogs . Several years ago we successful rescued over 80+ feral goldens from the Isle of Whyte and were able to successful acclimate them into loving homes is one of our biggest success stories. Sara England in particular for prints. But we also have volunteer artists that have donated drawings for printing Christmas cards. A typical Saturday at the Market. What’s not to love about the Southside Market? During market season, this is the place to be and on any Saturday you are likely to find anything and everything you might need. I continue to be impressed with the variety of vendors and the superb quality of produce, meats, flowers, jewelry and other hand made items that local growers and artists bring with them to sell. And being a Westover Hill resident it is always wonderful to chat with neighbors and to talk and meet new people as they stroll through the market area. As a nonprofit charitable organization, it has been wonderful to get the word out about the Southeastern Virginia Golden Retriever Rescue, Education, and Training (SEVA GRREAT) organization and the work we are doing in rescuing abandoned, stray and surrendered Golden Retrievers. The marketplace has offered us a visible arena to meet with interested adoption families and to reunite with others who have already benefitted by adopting one of our beautiful Golden Retrievers while also raising funds through the sale of available SEVA GRREAT items. And last but not least, the Southside Market has provided us with an opportunity to expand local awareness about who we are, the benefits of getting a Golden Retriever through our adoption program, the significance of our Education and Training programs and the GRREAT things we are accomplishing through our Golden community of volunteers. So in closing, the Market is a happening place that offers a wide variety of items. It is loads of fun, a meeting place for neighbors, a destination for Richmond residents and did I mention that dogs are welcome (on a leash of course).